$150 when you register for a preauthorized monthly transfer to a mutual fund. Offer available exclusively to persons and businesses whose corporate domicile is in Canada. To obtain the $1,500, you must meet the conditions of eligibility. 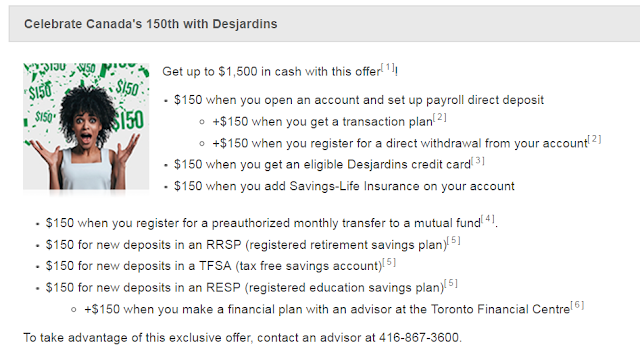 Promotion applies only on products offered at the Toronto branch of Desjardins Voyageurs Credit Union at 11 King Street West. This limited time offer (from May 1, 2017 to December 31, 2017) may be withdrawn at any time without prior notice. Some conditions apply. Note: To take advantage of this exclusive offer, contact an advisor at 416-867-3600. Please read the terms on the website before you make the call.